1970's 14k gold earrings with high domed Persian turquoise cabochons created by Ole Lynggaard of Copenhagen, Denmark. Earrings are of the clipback variety and could be converted by a competent jeweler of your choice. They measure 1 1/8" by 1" and are signed Ole L, 585. In very good vintage condition. Three undulating bands of gold make for very sculptural Modernist earrings. Measurements are 3/4&quot; wide and 7/8&quot; tall. Backs are clips. These earrings in 18kt yellow gold features large oval shaped turquoise stones, surrounded by round diamonds with a total carat weight of 5.60ct. 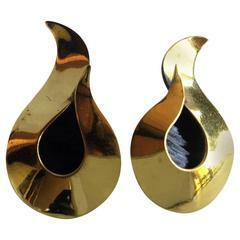 These earrings are in 18kt yellow and white gold. 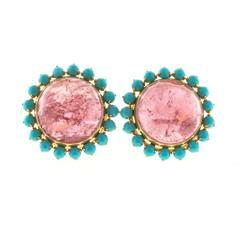 They feature 2 oval cabochon turquoise surrounded by yellow gold and 3.40cttw of diamonds.